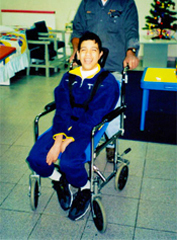 In 2007 SOS established its first contact with the charity known as MEDiCT and agreed to fund the shipment of a container to transport seating equipment and wheelchairs out to the charity for use in its work in Mexico. SOS has now adopted MEDiCT as its official charity and is now organizing the collection and transportation of equipment out to the centre on a permanent basis. We have already had tremendous support from many of the wheelchair centres that we know, kindly donating equipment to the charity. Below is detailed information relating to the Mexican Disabled Children’s Trust and the fantastic work that they do. All the people involved are volunteers and receive no funding and a totally dependent on charitable donations. If you would like to help SOS with this project by donating equipment then please contact SOS for further details. Remember, what appears to be redundant to us can be truly ‘life changing’ to someone else. who would otherwise only know pain and misery. We support a large charitable institute in Mexico called Nuevo Amanecer, (New Dawn), where hundreds of disabled children with cerebral palsy are treated and educated. Mexico is a very poor country and there is little state help for disabled children. Our support takes the form of special wheelchairs and vital equipment which the children need to live as normal a life as possible. Without expert help the children often develop severe deformities like these. 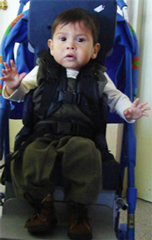 Using methods developed in the UK, special individual seats are made for each child, supporting and correcting posture where possible, with dramatic results, these pictures show Chacho, a cheerful, intelligent boy, shown before and after using his custom-made seat. Chacho has cerebral palsy and his only independent ability was pushing himself backwards in the wheelchair. He can still do this in the new seat but he can also breathe and swallow better, he no longer needs to use his hands to stop himself from falling out of the chair and he can pay attention in class and play with his friends. In addition, the risk of long term deformity has been drastically reduced. These pictures show the tremendous difference there is in the children, with and without their individually made seats. To give these children with cerebral palsy the best possible chance of realizing their potential, treatment is needed at a very early age. Our relationship with Nuevo Amanecer started in 2000 and since then Medict has facilitated 7 training courses for therapists and staff given by experts from the UK and Holland. A further 8 specialist doctors, therapists and engineers have visited to share their knowledge and expertise. Medict has also sent two containers full of special seats and wheelchairs to the institute. We do as much work as possible with expert volunteers but we need to raise money to pay for training courses and to fund the employment of a small number of Mexican support staff. 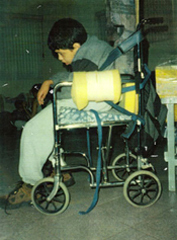 We also need money to help provide more of the vital wheelchairs and special equipment the children need. Nuevo Amanecer already help other clinics in Mexico by sharing their knowledge and expertise and we want to support them as much as possible in their efforts to do this, so that the lives of more children can be transformed. Our expenses and overheads are minimal so almost every penny raised goes directly to helping the children.